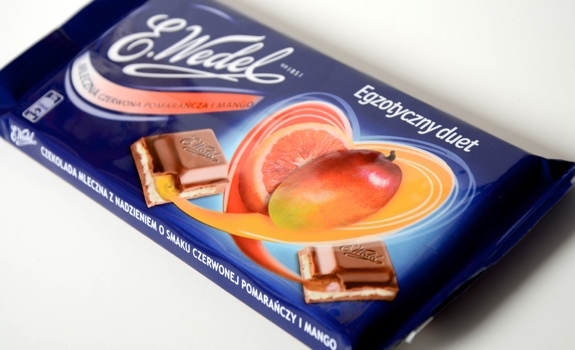 The E. Wedel Blood Orange and Mango chocolate bar wrapper is pretty slick. How’s this for an interesting chocolate bar flavour: blood orange and mango filling. In recent years, mango has become a trendy taste to add to all sorts of things, and the fruit itself is getting easier and easier to find in North American grocery stores of even moderate size. Blood orange, however, is still a bit out there. There are all sorts of other oranges commonly found at the supermarket, but blood oranges remain a showy afterthought. I’ve tried them during citrus month promotions at a grocery chain in Edmonton, and you occasionally see blood orange slices served as breakfast garnish at particularly hip diners. So why go so specific with this chocolate bar’s filling? Is it because they know bloggers like me are going to find the very notion of a blood orange chocolate bar a curious draw? 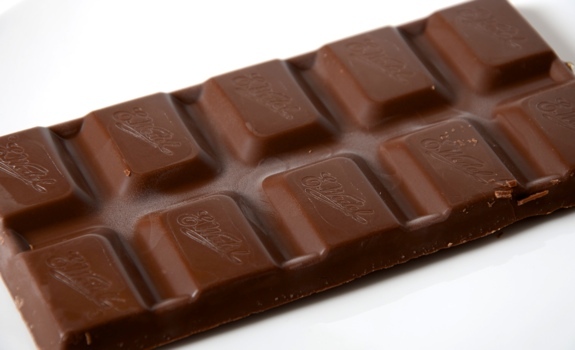 The chocolate bar itself is pretty plain looking ... until you crack open those chocolate squares. The Pitch: Hardly any info on the packaging, other than the super-long ingredients list and the “Milk chocolate with blood orange and mango flavoured filling” description on the back. The bar is made in Poland, and there’s some Polish language pitching that doesn’t appear to be translated. The Look: Nice, slick, professional wrapper with a colourful illustration of fruit and chocolate, and fancy nutritional-info graphics. It has a nice peel-apart seam on the back, which makes for easy opening. The bar itself looks unremarkable; very workmanlike. The Taste: Tart and tangy, with a sweet, creamy filling and jammy fruit innards. 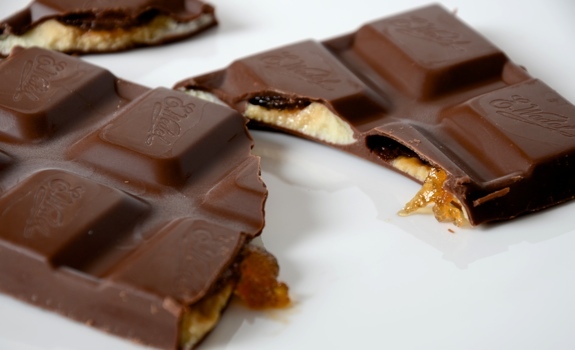 The chocolate is mediocre — more chocolate-covered raisin than good milk chocolate — and the filling, while nice, isn’t a stand-out. Is it blood orange or just plain orange? Hard to tell, frankly. You can taste some mango in the mix, but it’s not front and centre. The texture is more interesting than the taste, owing to the jam aspect of the filling. Most filled chocolate bars go the sticky flavoured fondant route, whereas this one has opted for a hybrid fondant/jam centre. I like the idea, but the execution is off. See that? Creamy filling, as well as jam. Neat! Cost: $1.69 for a 100 gram bar at the Italian Centre Shop (South) in Edmonton. Availability: This is the first I’ve seen it. In Edmonton, try the Italian Centre shop. Elsewhere? No idea. Specialty European shops, probably. Nutrition? : Per quarter of the bar (25 grams): 124 calories, 6.6 grams of fat, 20 mg of sodium, 0.4 grams of fibre, 1.2 grams of protein. The verdict: Curious, but not outstanding. If I have inadvertently insulted Poland’s national chocolate bar, I apologize. Some nice detail on that cream and jam filling. Hmm, that’s one I haven’t tried…then again I haven’t bought much chocolate at the Italian Centre lately. Is it Wawel or Wedel that’s(if I recall the small print on whichever wrappert)is owned-or a subsidiary of Schweppes-Cadbury or something like that? I’ve recently picked up some fairly decent Romanian-brandname ‘HEIDI’-chocolate bars at the Bulk Barn, here in Strathcona. Thought the pear & almond was good, the white chocolate with orange & pumpkin seeds was unique-pumpkin seeds kind of a different touch, & I have a 50% minimum cocoa solids bar with cranberry pieces. Yea, white chocolate with candied orange peel & pumpkin seeds. Very nice special-of sorts-at the Bulk Barn yesterday, French ‘Flagrants Desirs’ chocolate(72% minimum, with cocoa nibs), $2.99 for a 100g bar. Certainly a better quality chocolate for that price, I think. 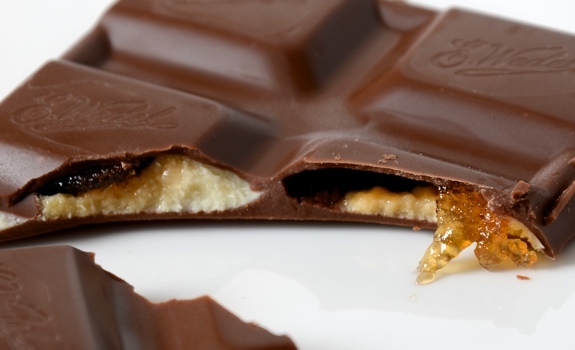 Beats a same size Lindt bar at a $ more, imho. One of the latest purchases on my at times relatively wide-ranging chocolate quest lol…an all natural-so it says-Spanish Valor bar, 70% min. cocoa solids with toffee granules for a bit of crunch. I was browsing the cookware/kitchen utensils/condiments section in Winners & lying amongst the other goods were a couple Valor bars…& 1/2 price too – regular $3.99 going for $2! So I snapped those up -a plain 70% minimum & the aforementioned toffee bar.